What is the sharing economy? It’s definitely a buzzword that you may have seen tossed around over these past few years. 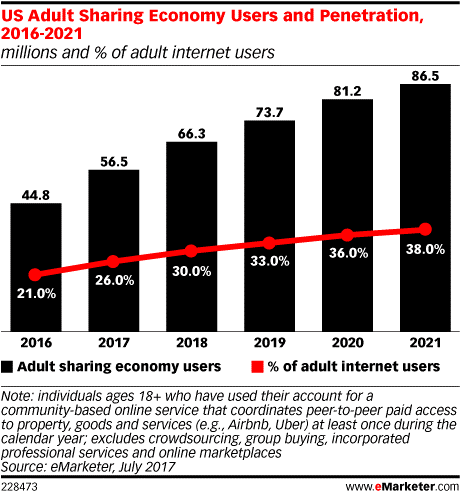 In a nutshell, the sharing economy can be described as a peer-to-peer based system of providing or sharing access to goods and services that is facilitated by a community based online platform. Over the past decade, the rise of the smartphone has accelerated the growth of the sharing economy by providing everybody with direct access to goods and services in the hands of ordinary people. Utilizing the sharing economy to your benefit can reduce the costs associated with daily life or travel and leave you with more money to pay down debt in your pursuit of debt-free living. One of the most prominent examples of the sharing economy are the unparalleled success of Uber and Lyft. In case you’ve been living under a rock for the past few years, Uber and Lyft are smartphone applications that allow users to hail a ride from their smartphones. Instead of hailing a ride from a traditional cab or car service, passengers are actually being connected with regular drivers who are using their own personal vehicles for transport. The flexibility of this system works well for both parties. It allows drivers to utilize their personal assets in a way that can generate spare income in their own free time (driver’s are not required to log a minimum amount of hours or to drive at specific times). Additionally, it has driven the rates for transportation way down when compared to taxi services. A big part of this rate reduction is because Uber and Lyft operate outside of the burdensome, crushing, and overreaching government regulation that has always suppressed private industry. Many frugal consumers are now turning to another sharing economy platform, Airbnb, in order to access affordable accommodations when they’re on the road. Airbnb is a smartphone app and website that connects hosts (homeowners) with guests. It allows homeowners to rent out a spare room or their entire home to travelers on a nightly basis. The rates found on Airbnb are often far less than those offered by traditional hotel chains. Once again, the big factor behind these low rates is because they are operating outside of the crushing government regulation that makes running a hotel so incredibly expensive. Homeowners are simply able to rent out a room when it works best for them, on their terms, and at the pricing that covers their costs with a little extra for their troubles. Lending is another space that hasn’t been immune to the expansion of the sharing economy. Up and coming peer-to-peer lenders such as USA Express Loans, who offer $255 payday loans online in California, and Lending Club, who offer peer-to-peer loans up to $35,000 have all embraced the concept of the sharing economy to the benefit of both investors and borrowers. Investors on these platforms who fund loans aren’t big banks or hedge funds. They’re just people like you and I who have some spare cash lying around in their savings and wish to generate a larger return on investment (ROI). They’re able to choose from a list of borrowers who are in need of a payday loan or a cash advance, and fund those loans directly without ever involving a large banking institution. In the end, the sharing economy can enable you to obtain the same goods and services at a much lower price than offered by traditional companies. The categories discussed above only represent small portions of the sharing economy at this time. Not only that, but the industry is growing. It seems like a new company is on the horizon each and every day. We encourage savvy savers to use the sharing economy to their benefit on both sides of the coin; renting out a spare room in their home in order to generate extra income, or using ridesharing applications instead of a traditional taxi service in order to get from point A to point B when you’re out on the town. Every penny counts when saving money and paying down debt. The sharing economy certainly provides many opportunities to save and make money! Has anyone heard about the product OnTrajectory before? It was recently introduced to me as a way to plan and make financial projections way further out than what I’m used to doing (which is to say…basically a month or two at a time). But not only that – the software allows you to see how simple little lifestyle changes can amount to HUGE financial gains across time. Like that specialty coffee you may get a couple times a week? Let’s say it costs $5 three times a week for a total of $15/week. Across the course of one’s lifetime ($15 x 3536 weeks) = over $50 GRAND spent just on coffee! Multiply that by an assumed 3% inflation rate and you’re wasting over $100,000 on coffee! This intrigued me. What might the program say when I plug in all my financials? I gave it a try through their 14-day free trial program and was pretty surprised when – right off the bat – it warned me of a potential shortfall when I get into my 80’s. But they don’t just leave it at “oh, you’re screwed!” – there are realistic suggestions on how one might save more or reduce expenses to make sure you aren’t outliving the money you’ve saved. This is of huge importance to me given everything I’ve seen and been through with my father’s dementia. So far, we’ve been able to support him on money he had earned in his lifetime. But his memory care facility costs $7,000/month. Yes. SEVEN THOUSAND A MONTH just for rent. It’s incredible the cost of high-quality memory care. And that’s a pretty competitive price for his area (Austin, TX). There are cheaper facilities, but if you’re looking for high quality care….that’s about the typical going rate. I’ve always said – I don’t care if I have no inheritance, just as long as my parents are able to pay for their own end-of-life expenses, I’ll be happy. Thankfully, I’m young. I still have a lot of financial “what if’s” hanging out in the universe in relation to my marital separation. But once that chapter is closed and I move onto whatever lies ahead, it will be much easier to have a clear-cut picture of what monies I can save and invest, where I can potentially cut expenses, etc. Getting fully out of debt is a BIG part of that picture! I will say, OnTrajectory seemed to have a steeper learning curve associated with it than some of the other financial products I’ve used (e.g., YNAB and Every Dollar), but they do send out helpful email tips and there’s a whole guided walk-through of the program that you can try out to make sure you understand how it works, etc. There is a huge difference between YNAB, Every Dollar, and OnTrajectory though. The latter two are focused on short-term planning while OnTrajectory is projecting your long-term finances, making the additional technological learning well worth it. I’m curious if anyone else has heard about and/or used OnTrajectory? If so, let me know! I’m curious to hear about your experiences and whether it’s helped shape some of your own financial goals!